If you are a Short Sleeper, you may have BHLHE41 or the "Short Sleeper Gene"
The BHLHE41 or "short sleeper" gene was discovered by UCSF Scientists (He et al. 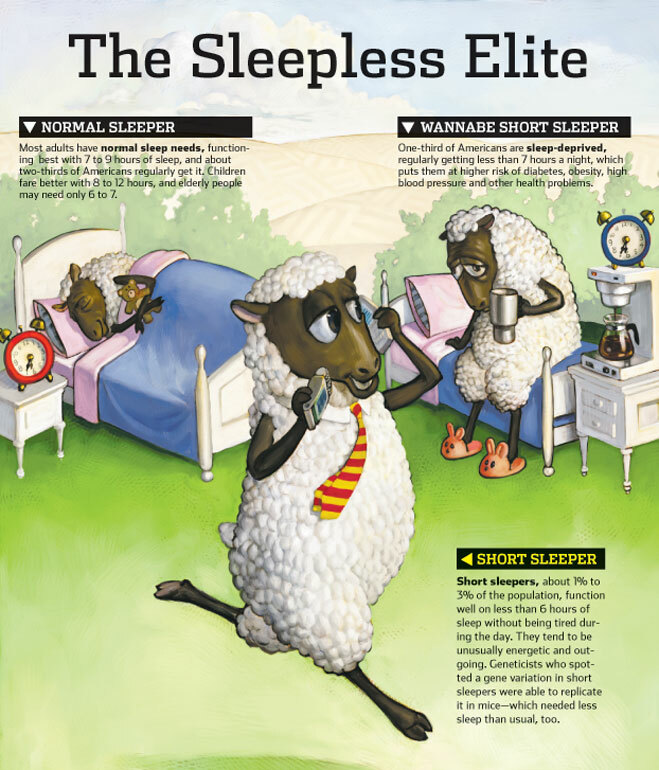 (2009)) who were screening the DNA in blood samples from several hundred sleep study participants and spotted two DNA samples with abnormal copies of the DEC2 gene, which is known to affect circadian rhythms. They then tracked down the people who had given the samples with the abnormalities and found a mother and daughter who functioned properly on approximately 6 hours of sleep per night. They then tested this mutation on mice (bred the mice with this mutation) and discovered a similar adaptation to shorter sleep time. When scientists bred mice with the same mutation, the animals slept less and recovered quicker from periods of sleep deprivation compared with regular mice. The mutation in BHLHE41 causes the amino acid, argenine to be substituted for the amino acid proline. Proline is obserevd to be highly conserved among mammals at this position (for which argenine was substituted) and therefore seems to suggest that natural selection has selected against deviations from proline at this position to account for longer sleep. According to AceView, this gene is expressed at high level, 1.9 times the average gene in this release. The sequence of this gene is defined by 226 different identifiers or "accessions" from 192 different cDNA clones. Some clones are from brain (seen 13 times), the placenta (13), lung (12), eye (11), hippocampus (9), melanocyte (7), multiple sclerosis lesions (7) and 88 other tissues. The gene contains 7 distinct gt-ag introns. Transcription produces 7 different mRNAs, 5 alternatively spliced variants and 2 unspliced forms. There are 3 possible alternative promoters and 3 validated alternative polyadenylation sites. The mRNAs seem to differ by the 5' end, overlapping exons with different boundaries and whether or not2 introns are spliced or retained. BHLHE41 interacts with the gene ARNTL, which encodes for a basic helix-loop-helix-PAS domain transcription factor that aids the regulation of molecular circadian rhythms. There are 19 articles specifically referring to this gene in PubMed. BHLHE41 is thought to be associated with diseases, such as Adenocarcinoma, Lung Neoplasms and more, which participate in Circadian rhythm processes in mammals. Protein coding potential: The 5 spliced and 2 unspliced mRNAs encode good proteins, which altogether are 7 different isoforms (4 complete, 1 COOH complete, 2 partial), some contain domains (Hairy Orange, Helix-loop-helix DNA-binding domain, some transmembrane domains, a second proximal domain). This essentially means that part of the protein binds DNA. 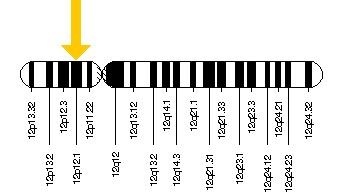 This gene is also known as BHLHB3 which acts as a transcriptional repressor, which is now considered to be a candidate to be a lung cancer suppressor (Gene Therapy). NCBI. U.S. National Library of Medicine. Web. 12 May 2014. <http://www.ncbi.nlm.nih.gov/IEB/Research/Acembly/av.cgi?db=human&c=Gene&l=BHLHE41>. "Genes and Mapped Phenotypes." National Center for Biotechnology Information. U.S. National Library of Medicine. Web. 22 Apr. 2014. <http://www.ncbi.nlm.nih.gov/gene/79365>. "This Web Page Was Produced as an Assignment for an Undergraduate Course at Davidson College." The Short-Sleeper Gene. Web. 12 May 2014. <http://www.bio.davidson.edu/courses/genomics/2006/lahre/Sleeper.html>. Zimmer, Carl. "Mountain Populations Offer Clues to Human Evolution." The New York Times. The New York Times, 29 May 2013. Web. 12 May 2014. <http://www.nytimes.com/2013/05/30/science/mountain-populations-offer-clues-to-human-evolution.html?_r=1&>.